The Philippine National Health Insurance Program (NHIP) provides health insurance coverage and ensures an affordable, acceptable, available, and accessible health care services for all Filipino citizens. It also serves as a means for the healthy and who have the resources for medical care to help pay for the care of the sick and for those who cannot afford it. 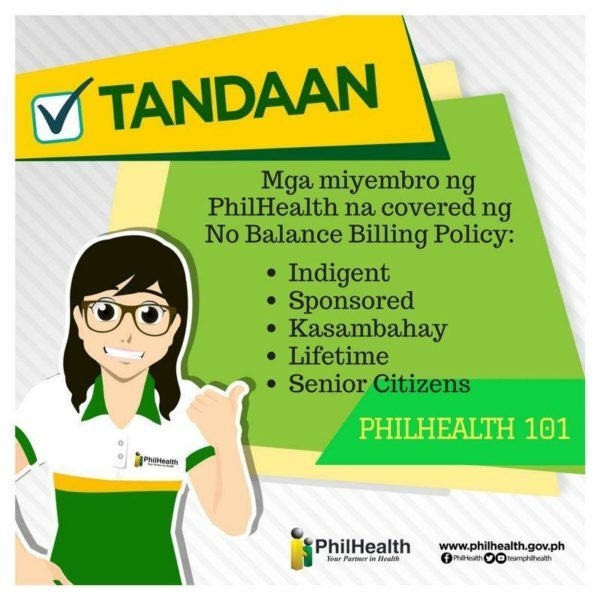 The Philippine Health Insurance Corporation, or PhilHealth, implements the NHIP. All Filipinos have mandatory coverage under PhilHealth, by the principles of universality and compulsory coverage as provided for under the Universal Health Care Law. Members are classified as those belonging to the formal or the informal economy; as indigents; as sponsored members, or a lifetime member. PhilHealth members and their dependents are qualified to receive services such as in-patient care; out-patient medical and surgical care; emergency and transfer services; Health Education packages; and other appropriate and cost-effective health care services determined by the PhilHealth and the Department of Health. To avail of these services, a member must have paid the premium contribution for at least nine months within the 12 months before the first day of availment or have paid in full the required premium for the entire year. Retirees and pensioners of the Social Security System (SSS) and the Government Service Insurance System (GSIS), as well as the PhilHealth members who have reached retirement age and have at least 120 months’ worth of premium contributions are entitled to avail of PhilHealth benefits and services but do not have to pay any contributions anymore. For those individuals who have not registered yet as PhilHealth members may do so online through www.eregister.philhealth.gov.ph. This online facility may be used by employed and self-employed members, overseas Filipino workers, and retirees in the government and private sector. 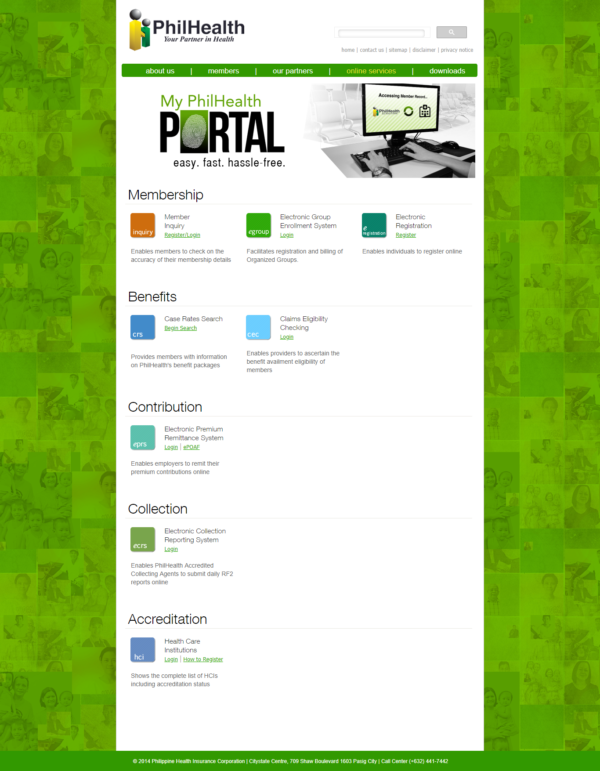 A welcome page will greet you once you arrive at the PhilHealth Electronic Registration System. Clicking the ‘Proceed’ button on this page will take you into the Terms and Conditions page where you will have to tick the box to indicate that you agree to the conditions stated and will comply with submitting information and supporting documents to complete the registration. You will also have to click the ‘Accept’ button to be able to go to the next page. The following page contains a form which you will need to fill up. Once all boxes have been completely and adequately filled-up, click the ‘Submit Registration’ button. After doing so, you will be taken into another page which says that member information was successfully saved. It will also tell you to check your email for the confirmation message containing a link which you have to click to complete your verified registration. 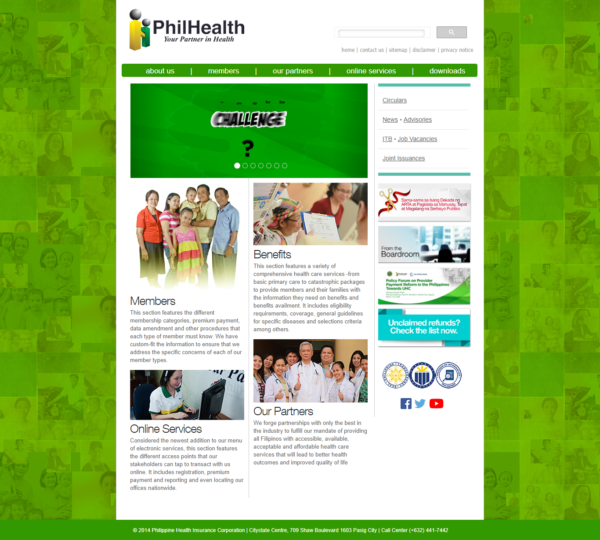 For more information about PhilHealth’s online registration, benefits, and other services, please visit their website at www.philhealth.gov.ph.